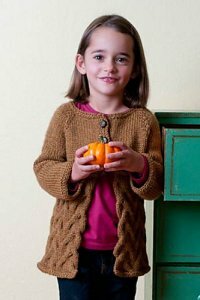 This darling kids cardigan is the perfect winter weight knit for your favorite little one! Size US 9 and 10- 29" Circular needles and DPNs (or size needed to obtain gauge), cable needle, stitch holders, 3 buttons for the two smallest sizes and 4 buttons for the two largest sizes are required but not included. Finished Bust Measurements: 25(27.5, 30.5, 33)" after blocking. Gauge: 15 sts and 20 rows over 4" in St st on larger needles. Color Shown is #6192 Chana Dal.